Highway 40 meanders through the mountain peaks in Kananaski Country in Alberta, Canada. Highwood Pass is at the summit of Highway 40 that reaches heights of 7239 feet in Peter Lougheed Provincial Park in Alberta, Canada. This highway is only opened from the middle of June to the end of November as the road can become very treacherous in the winter months. Highway 40 near Highwood Pass, Peter Lougheed Provincial Park, Kananaski Country, Alberta, Canada, North America. 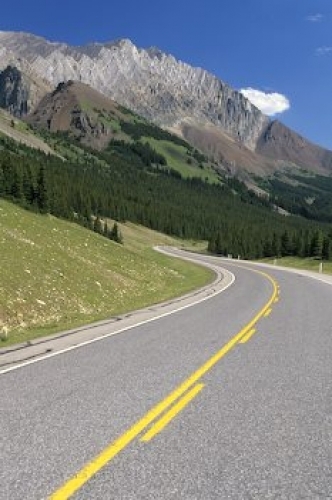 Picture of Highway 40 at Highwood Pass in Alberta, Canada.